Today, love simulator New Love Plus went on sale. Today is also Valentine's Day. 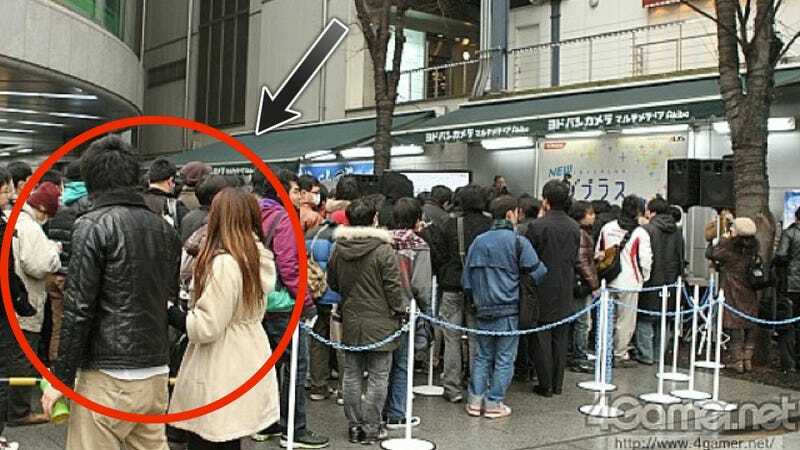 A photographer at Japanese game site 4Gamer snapped this photo, which seems to show a young couple passing by the Love Plus Akihabara launch, which is populated with dudes. Online in Japan, commenters are saying that the couple is probably wondering what the hell is going on. Granted, they could be buying New Love Plus. On Valentine's Day. Together. It's possible! Other commenters are pointing out how good the photographer's timing is and how the photo shows the contrast between those dating virtual girls and a guy with a real one.